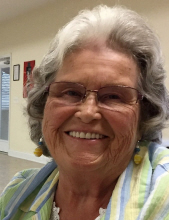 Betty Joyce Robbins Swink, 76, of N. Circle Drive, Shelby, passed away Friday, February 1, 2019 at Atrium Health - Cleveland in Shelby. Born in Cleveland County, June 25, 1942 she was a daughter of the late Eldridge Lee "Pete" Robbins and Jesse Louise Jackson Robbins Sailors. She was a homemaker who loved her family. Betty was also an active member of Corinth Baptist Church, where she worked with the food committee and food pantry ministry. She is survived by her husband of sixty years William David "Bill" Swink; son, Dan Swink and wife Teresa of Shelby; daughter, Sandra Hudson and husband Gary of Casar; brother, Jimmy Robbins of Forest City; five grandchildren, Alicia MClean, Danielle Lowery and husband Doug, Eric Champion and wife Leann, Jessica Fulk and husband Travis, and Anna Swink and husband Brandon; and six great grandchildren. The family will receive friends on Monday from 1:00pm to 2:00pm at Stamey-Tysinger Funeral Home, Fallston. The funeral service will be held on Monday at 2:00pm at Stamey-Tysinger Funeral Home Chapel with the Rev. Robert Goins officiating. The burial will follow the service in the New Bethel Baptist Church Cemetery. Memorials may be made to Corinth Baptist Church, PO Box 188, Casar, NC 28020. Arrangements have been entrusted Stamey-Tysinger Funeral Home & Cremation Center, Inc., Fallston. To send flowers or a remembrance gift to the family of Betty Robbins Swink, please visit our Tribute Store. "Email Address" would like to share the life celebration of Betty Robbins Swink. Click on the "link" to go to share a favorite memory or leave a condolence message for the family.